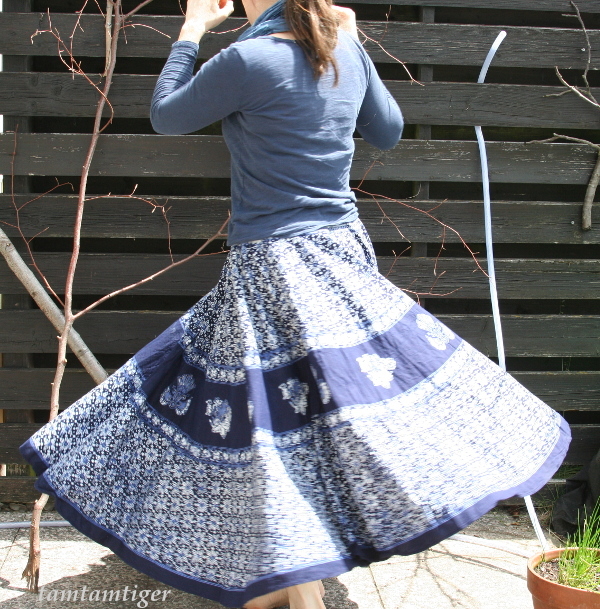 This is the final virtual meetup of the Summer-Skirt Sew-Along hosted by Meike and Lucy on the MeMadeMittwoch Blog. You can see my two new skirts here and here. Tischdeckentellerrock: Ein Tellerrock aus einer secondhand Tischdecke (ausführlich hier vorgestellt). Rosa Blumenrock: ein leichter Baumwollrock nach altbewährtem Burda-Schnitt (ausführlich hier vorgestellt). 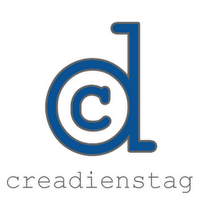 Ha, und ich dachte, ich hätte einen Schrank voll T-Shirts & co. Aber jetzt merke ich, dass ich doch noch etwas für meine neuen Röcke brauche! Jetzt werde ich also doch endlich die Shirts von meiner Brot-und-Butter-Wunschliste in Angriff nehmen? 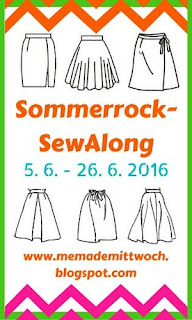 Und jetzt freue ich mich auf die Ergebnisse der anderen Teilnehmerinnen des Sommer-Rock Sew-Along Finales! 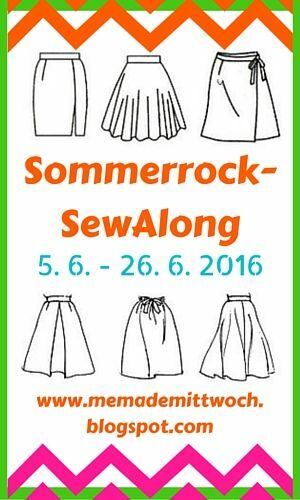 The post Sommer-Rock Sew-Along Finale appeared first on tamtamtiger.wordpress.com. 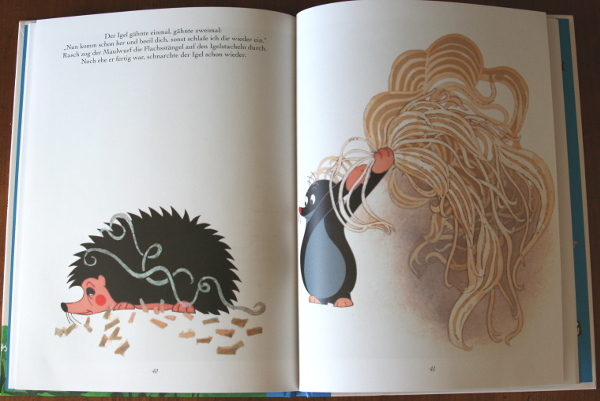 I would like to tell you about three great children books which all have sewing as a central theme: How The Mole Got His Trousers by Zdeněk Miler (we have it also in board book edition), Pelle’s New Suit by Elsa Beskow and Bruno the Taylor by Lars Klinting. In all three books the main character sets out to make himself some new clothes and the reader is taken through the process. My boys love all of them and they sparked quite a few discussions about making our own fabric and cloths. Last summer we even planted some flax seeds in our garden – no, we didn’t make linen, but we thoroughly examined the plant. How The Mole Got His Trousers by Zdeněk Miler: The little mole needs a pair of trousers with big pockets for all his precious possessions. He learns to take care of the flax plant and how to make linen from it. 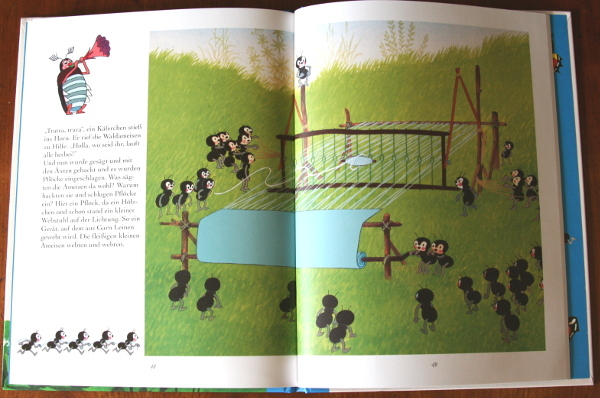 The animals around him are helping with harvesting, spinning, weaving, cutting and sewing. This story is originally a movie. It was Miler’s first movie about the little Mole and is very worth seeing. 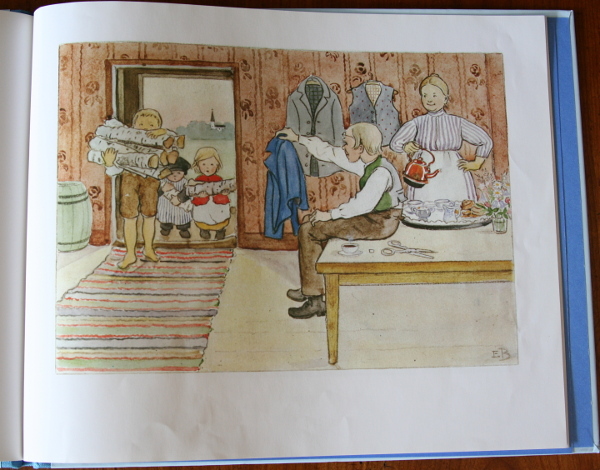 Pelle’s New Suit by Elsa Beskow: This book is about the little boy Pelle who outgrew his cloths. 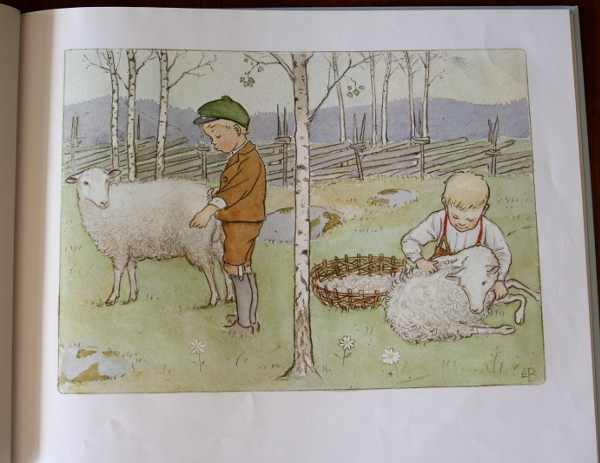 He owns a sheep and the book shows how Pelle cuts the sheep’s wool and how family members help him to comp, spin, color and weave the wool in exchange for him taking over some chores. And finally the tailor makes him a wonderful new suit. 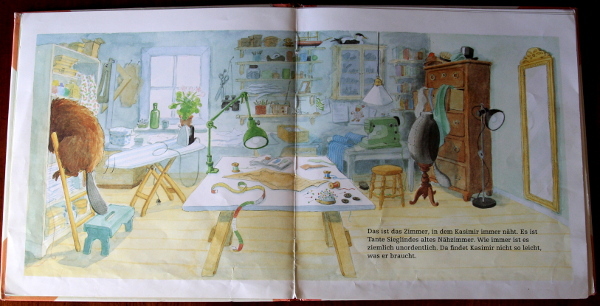 The beautifully illustrated books by Elsa Beskow are a treat for all children (and parents)! 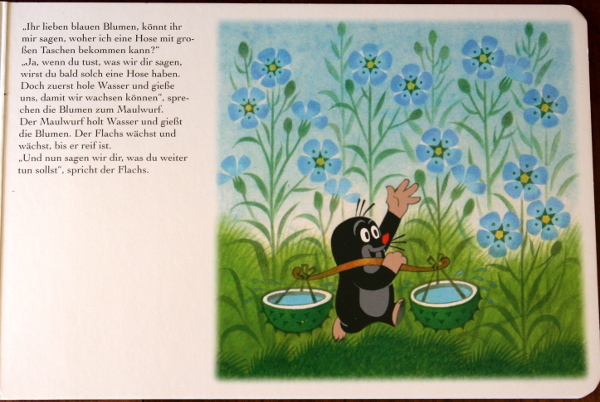 Bruno the Taylor by Lars Klinting: The beaver Bruno (or Kasimir how he is called in German) needs a new apron. He selects fabric from his stash, washes it, makes himself a pattern and sews the apron. At each step it is explained what is needed, including some sewing tips and at the end instructions for how to make an apron oneself. 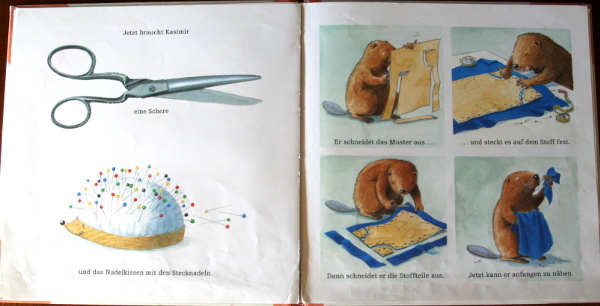 The Swedish author created a series of books about the beaver creating or crafting different things (Bruno the Baker, Bruno the Carpenter, and others) and each time the reader is taken through the process and left with accessible do-it-your-self instructions. Not for me, because I really don’t have enough to show. And with two small kids, visitors to come and unpredictable workload, I don’t feel confident to make a pledge of any kind that would promise any number of newly sewed garments. Maybe next year? Veggi-Donnerstag : every Thursday tasty vegetarian dishes to support “Donnerstag=Veggietag“ (Meatless-Thursday). Immer wieder Sonntags: 7 Bilder von 7 Sachen: every Sunday seven pictures of things you did with your hands. 12 of 12: On every 12th of the month, show 12 pictures of your day. 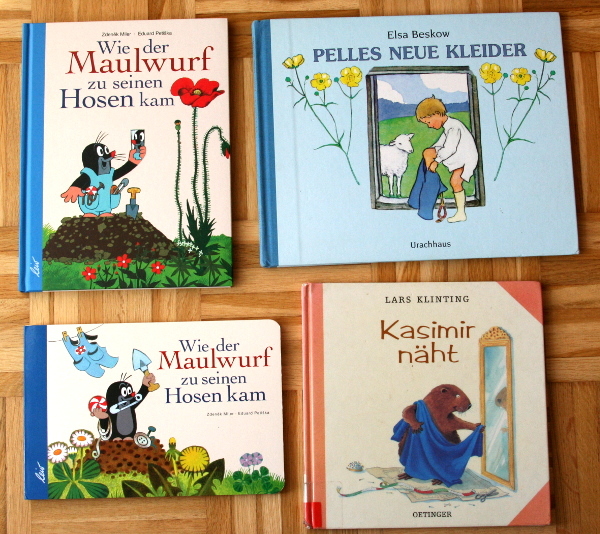 Ein Zwoelftel: One twelve-th (1/12), show how one scene changes from month to month. 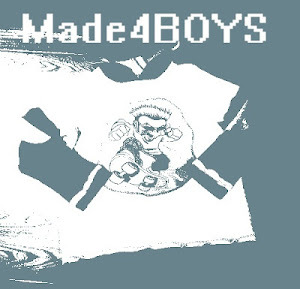 Made4BOYS: Every month there is a link-collections for items made for boys. Those are all I know of, but I will add “blog-alongs” as I encounter them. It is really very busy out there! 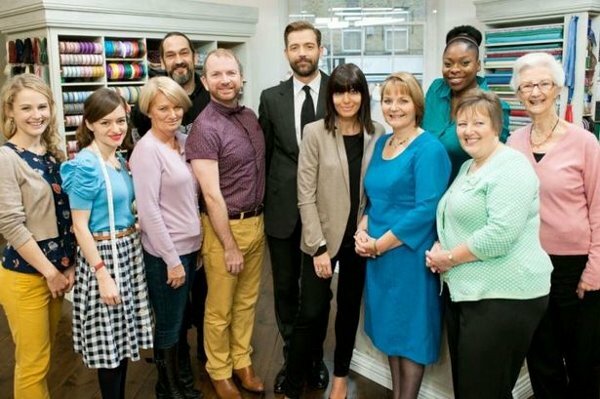 The Great British Sewing Bee is a fun to watch talent show on BBC-2. It is a sewing show following the usual talent show format (the contestants have to perform challenges, they are judged by some experts and someone is send home every week). Aside from the format, I really enjoyed the show. I think it is well done, providing lots of extra information about sewing and fabrics. Each challenge is accompanied with some explanations of the technique, its difficulties and possible solutions. And each show also has short episodes of historical trivia and a simple DIY instruction. I watches the first tree episodes on YouTube (Episode 1, Episode 2, Episode 3) and I am looking forward to the final which airs tonight – and will be online hopefully soon, too. Update: here is Episode 4. 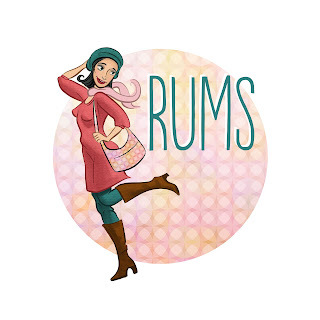 I find the show very inspiring and it makes me want to go and get sewing right away! Unfortunately, I am in the process of cleaning up my workspace, need to buy fabric and prepare for visitors to come…. so no sewing for me for a bit. Our older son will enter school in the fall and we enrolled him in our local Waldorf School. One of the guidelines of the Waldorf education entails the exclusion of any screen time for children. That means, no TV, no computers, no games, no smart phones and such. The idea behind this is that (in general) media kills creativity and overwrites the emotional experiences of the real life with those experienced in front of the TV. Although I do enjoy a good movie once in a while (we don’t have a TV, though) and spend way too much time in front of the computer, I do feel that our children can only benefit from a very limited exposure to media. Especially video games, I thought are outright evil. I still don’t think that playing video games is good, but here is a very interesting TED talk by Jane McGonigal about what makes gaming so attractive and how can we use the potential of Gamers, their optimism and enthusiasm, for the real world. Well, thinking of it, I am a scientist and I “play games” everyday in the lab. Or, in the evenings, I “play games” in the kitchen trying our new recipes, or at the sewing machine trying to sew a new garment. Maybe we should all make a greater effort to teach our children to enjoy the sweet fruits of success when experiments give good results or sewing projects fit, and that we can get so much better at it if we’d only spend so many hours? Our oldest son will turn six in September and will start school in the fall. Right now we are in the process of trying to decide which school will be right for him. We have to decide and sign him up for primary school withing the next couple of weeks. This is a nice TED talk about education by Sir Ken Robinson. Really great is also this talk: click here. As a side note: those TED talks are totally addictive! Don’t go their website if you don’t want to be clued to your screen for the next few hours….. 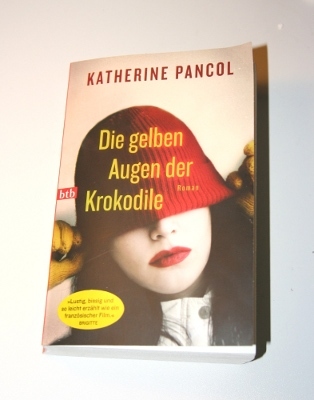 Die gelben Augen der Krokodile by Katherine Pancol. I read this book in German, I could not find an English version. The original is French (Les Yeux Jaunes des Crocodiles). I really enjoyed reading this book! And when I turned the last page I was sorry to say good-bye to the characters I got to know over the course of 600 pages. The sequel (Der langsame Walzer der Schildkröten) is now out in German in hardcover, but I decided to wait until it is available in paperback and I am definitely looking forward to meet again with Josephine and her family. At the centre of the book is Josephine, mother of two, an expert in 12th century history, working at the university. Her knowledge and skills are dismayed and undervalued by her family and surrounding, not only because she does not believe in herself. The book accompanies her on her path of gaining strength and blossoming into a successful writer. The characters are vivid and (mostly) believable. And the story has a feel-good element which makes it a pleasant read. If you like stories about women who’s strength and talent are unrecognized by themselves and others and who grow as a result of circumstances and prevail at the end, then you might like this book!